A good jacket is the pillar of any wardrobe and constructing one is easier than you think. Join Pattie as she helps you construct one of her classic jackets. Class will begin with measurements to help determine the correct size. Try-ons will be available to aid in selecting the correct size and style as well as any pattern alterations that are needed. Basic jacket construction includes stabilizng, seaming, facings and binding as well as finishes touches such as buttonholes and shoulder pads. All patterns are sized for petite, average and tall figures. Note: Sizes are limited to measurements listed on the pattern back cover. 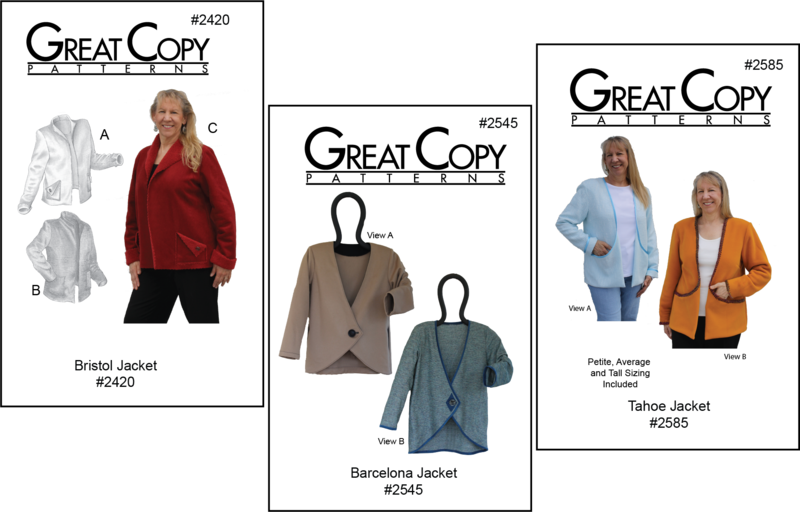 Choose from one of Pattie's Basic Jacket Patterns listed here: #2420 Bristol Jacket - Semi Fitted Jacket, #2545 Barcelona - Long Curved Front Jacket, or #2585 Tahoe Jacket - Front Pocket Jacket.